Getty did not buy Corbis..
…nor is it responsible for its sale to VCG. Rumors of Corbis being for sale have been floating since the summer of 2015 and while Getty must certainly have been approached, they never ran as a contender. Shutterstock, until the end of November, was the leading candidate until CEO Jon Oringer during a quarterly report, dismissed the idea. Immediately after, VCG’s name came up until its public announcement. While Getty had a participation in VCG for a while, it had to relinquish that position when the Chinese company went public to comply why Chinese legislation that forbids any foreign holding in a publicly traded Chinese company. VCG has kept representing Getty throughout. Corbis was bought by Unity Glory United ( for less than $100 million), a subsidiary of VCG, apparently held by the same shareholders that own VCG. The probable reason is to avoid monopoly investigation by the Chinese government. There is no trace of Getty in Unity Glory. Where Getty participated is in helping VCG handle the assets of Corbis outside of China. VCG is currently not equipped to handle the proper licensing of any content outside of China, having no offices or personnel. While the situation might change in the future, it made perfect sense that it would let Getty handle it, in exchange for a commission. It now seems that deeper talks are now in progress but we will touch on that later. Nor is Getty responsible for Corbis’ demise..
…Corbis’s management is. Since its inception, Corbis has been plagued by a series of incompetent managers who have instituted and maintain a company culture detrimental to its blossoming. While incredibly smart and talented people have at one time or another filled the offices of Corbis, their truly enthusiastic efforts were crushed by a suffocating corporate structure, a complete disconnect between upper management and ground troops and overwhelming cynical office politics, resulting in obsessional repeated yearly layoffs. Incompetency eventually won, creating a financial zombie of what was an incredibly rich collection of images. And because profit was never a necessity thanks to Bill Gates’ annual check, it led to the chaos and ending we are now experiencing. While Getty has been a brutally effective competition, it is ultimately Corbis that took down Corbis. As said, Getty will review all content and partnerships to include it, or not, into its current offering. Some, like wholly-owned Bettman Archives are an easy call. Others, like obvious redundancies, are an easy rejection. In between lies thousands of agreements that could go either way. It will take Getty time and, most importantly, costly resources. Going by the chaotic communication immediately following the announcement of the deal, it appears that all the elements were not thought through properly and most is left to “let’s deal with it when we get there”, both on VCG and Corbis part. Corbis was not an editorial powerhouse. It tried, it failed, many times. Their only holding that was and is successful in the editorial market is their recent acquisition, Splash ( celebrity content). It is not part of the deal and remains with what is left of Corbis. Thus, Getty is not going to increase its position on the editorial market because of the additional content. It might increase its position because it will recuperate some of Corbis editorial clients, but it is not guaranteed. Neither does this transaction result in a monopoly. First, with Shutterstock and now Adobe Stock, it would be hard for the US Government to conclude that Getty is in a position to affect the marketplace due to its dominance. Getty could try and increase rates in editorial, where it is the strongest, but with declining budgets in publishing companies, it would not succeed. It certainly will make it harder for newcomers to compete but that is just a common condition of a capitalist market. It’s a fire sale. For Corbis to sell all of its content for less than $100 million, which is far less than it has paid to acquire most of it, is a clear sign that Corbis needed cash fast and was in no position to negotiate. Assumptions are that Bill Gates did not give them his yearly check, most probably with an advanced warning, and in order to continue, they absolutely had to sell. It’s also a clear sign that it was not profitable ( why sell it if it was?). There is an understandable furor over seeing Getty and VCG splitting Corbis, which strangely enough, is mostly aimed at Getty, the least active participant of this deal. If anything, people should be angry at Corbis for a sloppy, careless job throughout. Apparently, no one wants to blame a cadaver. There are concerns over censorship ( which existed prior to this deal) and the potential destruction of historical archives, like Bettman in the salt mines of Pensylvania or Sygma in the suburbs of Paris. Last heard, Getty will take over the salt mine management and for Sygma, it is still unknown. There are concerns that with lesser players on the market, the remaining ones will have more control over the sales channels, crushing the small photo agencies and independent photographers. If anything, the constant rise of Shutterstock has shown that nothing is under anyone’s full control. The stock photo market has seen major players come and go ( The Image Bank, The Stock Market, Jupiter Media, FPG) and this is not the last time we see a change. It’s up to those who feel threatened to build another viable entity. 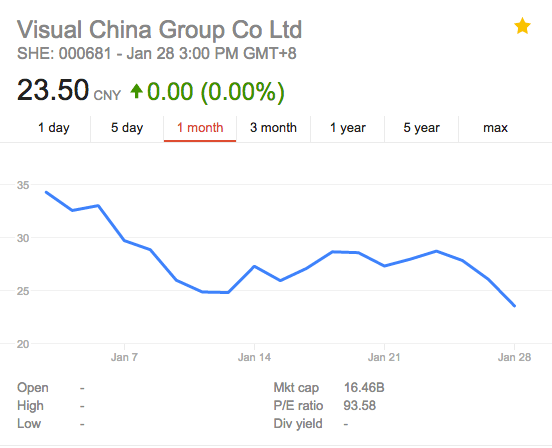 Since the public announcement of the deal, VCG’s stock dropped 10% in a week. While it is surprising, one would expect investors to be excited by such a deal, it is also very dangerous for VCG. Here’s why ( Simplified version): Owners of VCG took a loan on the stock they control on the company. However, in the stipulated arrangement with their banks, agreement were made that the stock would not drop below 19. If it did, it would be considered a default. Before being suspend, the stock had dropped to 23 and was continuing to drop. VCG stock dropped sharply after the deal was announced. It is now suspended. VCG management got the quotation suspension triggered by announcing a potential participation in Getty Image’s capital, a common procedure for the market. Along with the Chinese New Year, they hope it buys them enough time to create a situation that would reverse the stock value. If not, they are headed for chaos. Getty is certainly again in a position of force. They can negotiate a participation in their terms that will not only cover the cost they will experience by taking over most of Corbis’s operation but most probably alleviate some of their debt. Since VCG is a public company, we might actually have more details when it’s finalized. For now, it is clear that the full ramifications of this deal are not yet entirely known. From the emergence of new successful entities created by ex Corbis employees and contributors to the financial challenges faced by the acquiring parties, to the destiny of millions of film, negatives and prints that constitute our visual heritage, there are more surprises to come. Kristian Peetz liked this on Facebook. Yunghi Kim liked this on Facebook. Amos Struck liked this on Facebook. Sebastian Artz liked this on Facebook. Francis Specker liked this on Facebook. Dirk Schacht liked this on Facebook. Marco Oonk liked this on Facebook. Gilles Decamps liked this on Facebook. Danny Greer liked this on Facebook. Anita Windham Hanks liked this on Facebook. Susan Rosenberg Jones liked this on Facebook. Kevin Townsend liked this on Facebook. Kristin Sullivan liked this on Facebook. Jennifer Kerns Walker liked this on Facebook. William Radcliffe liked this on Facebook. Paul Velgos Photography liked this on Facebook. Estelle Veret liked this on Facebook.